South Korea’s appeals court upheld on Friday a lower court ruling ordering a Japanese company to compensate a group of Koreans forced into labor during Japan’s 1910-45 occupation of the Korean Peninsula, amid an escalating diplomatic row between the neighboring countries. The Seoul High Court upheld the 2014 ruling that robot supplier Nachi-Fujikoshi must pay 80 million to 100 million won to each of the 17 Korean victims forced to work at Fujikoshi’s arms factories in Japan from 1944 to 1945. When they were only 12 to 18 years old, the plaintiffs were lured to Japan with the promise of educational opportunities, but were forced to work 10 to 12 hours a day, six days a week, at a factory in Toyama without pay and under poor working conditions, according to the court. 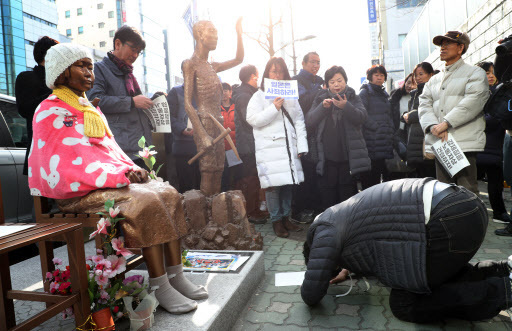 The victims filed a lawsuit in 2013 in Korea, seeking reparations for the mental distress they suffered as forced laborers, after a court in Japan ruled against them. Some 1,089 Korean girls are believed to have been forced to work at Japanese factories during World War II. The ruling is in line with the Supreme Court’s landmark ruling in October, when it ordered Nippon Steel & Sumitomo Metal Corp. to pay 100 million won to each of the Koreans forced to work at its steel mills during Japan’s colonial rule. The following month, the top court ordered Mitsubishi Heavy Industries to compensate 10 former forced laborers in a separate ruling. The rulings are straining diplomatic ties between Seoul and Tokyo, with Japan threatening to file a case with the International Court of Justice and signaling other measures. Tokyo has denounced the rulings as “unacceptable,” and is insisting that Seoul find a solution. Japan has said that all wartime reparations were settled under a 1965 treaty that normalized diplomatic relations between Korea and Japan. Under the treaty, Korea and Japan settled colonial-era issues and restored diplomatic relations in return for $500 million in grants and low-interest loans that contributed to Korea’s economic takeoff. A task force was formed under Prime Minister Lee Nak-yon’s office to find a way to respect the judiciary’s decision without further damaging Seoul-Tokyo relations.